Within the pages of Tammie Bridges’ new book, Mustard Seed of Faith ($17.49, paperback, 9781545637715; $8.99, e-book, 9781545637722), readers will read the author’s inspiring testimony of a lifelong journey toward hope, salvation, and read of her still-growing faith in God. Bridges’ life experiences, both positive and negative, spurred her to define herself while learning to trust God to fulfill His promises in ways she could have never imagined. Despite her life story filled with poverty, abuse, homelessness, homosexuality, sexual assault, drugs, alcohol, rejection, failure, suicide, and a bad marriage and divorce, Bridges knows God has plans to prosper her, not set her up to fail. Tammie Bridges’ upbringing was riddled with poverty, abuse, pain, and grief, which set the stage for countless poor choices as an adult. Despite what felt like impossible odds, God saved her and blessed her in spite of the mess. Xulon Press, a division of Salem Media Group, is the world’s largest Christian self-publisher, with more than 12,000 titles published to date. 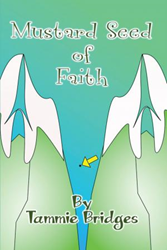 Mustard Seed of Faith is available online through xulonpress.com/bookstore, amazon.com, and barnesandnoble.com.